Santy is Fluoelf, a nomadic psytrance Dj and producer from Spain. He has been spinning since 2002, being part of the local scenes in Amsterdam, Barcelona and London. 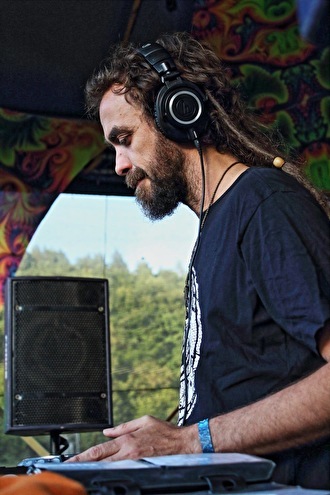 Highly skilled in the mix, his music is a blend of different Psytrance substyles: DarkProg, Twilight, Forest and Psy Techno, that he plays according to the time of the day and the music that surrounds him. The result, new djsets for every new dancefloor. Sets that evolves in waves, progressively increasing or decreasing, creating an hypnotic flow with a very personal and psychedelic style. Nowadays he is based in London, where he travels all over Europe and worldwide, delivering his sets to a wide range of events, including: Freqs16/17/18 , Lost Theory18 , Modem14 , Symbiosis16 , Human Evolution16 , Triplicity16/17 , Son Libre18 (Fr), Connection14/17/18, Solstice15 , Transition (ES-resident), Own Spirit and many other festivals and parties.